I will immediately preface this post by saying that my familiarity to this franchise extends only to the four films as well as the mid 90’s cartoon which I haven’t watched since then. Though I have heard other descriptions of how the team works in the comics, at least before it was cancelled by Marvel earlier this year. This team of heroes has gone through three different iterations, none of them have been critical successes, one of them wasn’t even released, and only one was much of a financial success. It doesn’t seem like it should be that hard to adapt this family of four heroes with unique powers that act together as a family, I mean the Incredibles was able to do it, so why can’t the Fantastic Four? Here are a few reasons why I think it’s been so difficult. Just like real brothers… five year old brothers. One of the biggest issues that the films have is that the Fantastic Four is a family that’s not really a family. Johnny and Sue are the only two who are actually related, though Reed and Sue get married at some point in the comics and in the second Tim Story film. But in the Tim Story version, the family side of things feels very forced, especially as they are essentially forced to live together in the first film, and they end up devolving into bickering. There is some merit to the sibling-like rivalry between Johnny and Ben which are some of the most enjoyable moments in the films from my perspective, though it is taken a bit too far into a caricature of sibling rivalry rather than real brothers. In the Trank version, there’s a nice relationship between Reed and Ben at the beginning, but it doesn’t really follow through to the rest of the film. There’s even the added aspect of the father figure Franklin Storm, but it still never really feels like they come together as a family in the end. Johnny and Sue barely feel like they’re supposed to be brother and sister, and it has nothing to do with their different skin colors. There should be some minor squabbling, but with underlying love and respect for each other. Even in an origin story, the seeds of those relationships should be building. But instead, the Tim Story version favors an hour of bickering with ten minutes of coming together and the Trank version has them all working on their own independent issues separately and again has ten minutes of coming together. If there’s an easy reason to point to as to why the Incredibles works as a pseudo Fantastic Four movie while the actual Fantastic Four movies fail is that the Incredibles makes the smart move to switch around some of the powers. They drop the guy who can burst into flames in favor of super speed which is much more non-lethal and doesn’t obscure anyone’s important facial features, and they drop the guy made of rocks which also has those same issues. Taken individually, and in the still image comics form, these powers work ok. There’s pathos that can be given over the long term with Ben Grimm not being able to live out a normal life. But truncated into a single movie, that’s an issue that has to take a backseat to dozens of other things that need to be accomplished in such a short time frame. Also, while the Trank version has the best looking version of stretching to date, it is still a very difficult concept for an audience to wrap their head around without being an additional logic step removed with an entirely animated character. Stretching is just not something that happens to real bodies using real physics. There’s also little use for a guy who can set himself on fire when it comes to being grounded in the real world. For a Fantastic Four movie to work, it needs that extra disconnect from reality. It could possibly work as a superhero movie satire or parody, but it’s hard to take these powers seriously at face value. What is it with Fantastic Four and giant clouds? For some reason, every Fantastic Four movie boils down to the four of them teaming up together in one way or another to beat back a singularly powerful villain that none of them would be able to defeat by themselves. The Corman version avoids the fighting by necessity as they had a practically nonexistent special effects budget. During an early fight scene, it cuts away and when it cuts back the minions are lying on the floor and there’s a Thing shaped hole in the wall. Also, the finale boils down to a badly animated Torch racing to intercept the slowest laser beam ever. The first Tim Story movie ends with a fire tornado, the second has a giant space cloud, and this ends with basically a different type of space cloud. Dr. Doom may be a great villain in the comics, but the movies have failed him time and time again. Instead, they need something that will actually give them something to fight, something with minions. Maybe not an entire Skrull army, but at least a group of powered villains that will put up a fight, but ones that they can defeat individually. Or even something that has them working together like the great opening sequence in X-Men Days of Future Past. What I mean by this is that every one of these films have been made in order to keep the rights to these characters rather than making a film that has a story that can only be told with these characters. They are all products of a studio and executives that have what they think is a property that will make them money and they just need to figure out how to squeeze the money out of it. The first and last films are prime examples of this. I still don’t fully understand why property rights are designed that film rights are given so that as long as they are being utilized, they can be kept seemingly in perpetuity. But the first film is probably the most well known story of a movie that was made with the sole purpose to keep the rights to the characters for a few more years, even though it didn’t end up helping that studio any. But Fox decided that this property was still worth keeping and greenlit the most recent reboot. It was given to young director Josh Trank after his success with Chronicle, but when the executives didn’t like how test screenings went, they ordered very late reshoots and seemingly took the editing away from Trank to create a slap dash film that feels like much is missing. This also calls back to mistake #2. Their origin is just as silly as their powers. Whether it’s a solar flare or energy from an alternate dimension, it doesn’t make much sense that these four, often five as two out of three versions give Doom his powers through the same event, people gain these extraordinary abilities that are wildly different from each other but still extremely powerful. Two of the three explain the powers via their personality – Sue is shy to the point of invisibility, Reed stretches himself too thin, Johnny is a hothead, etc. In the new film, there are touches of explantions for a couple of them, like Reed is stretching his arm to try and save Victor, and Ben has all the space rocks fly into his compartment, but the other two lack explanations. One of the things that I did like about the new film is that it jumps a year into the future so there is very little time on screen spent learning to use their abilities. I think more than any other property, the Fantastic Four just need to show up as an existing entity. Skip the origin entirely. I think that a good Fantastic Four movie can be made, it’s just a shame that it has yet to be done after four attempts. I’m still a bit of a fan of the first Tim Story film, but it’s admittedly a guilty pleasure. I also liked large parts of the new film, but I think that studio meddling caused it to turn out badly. I doubt that it will ever be released, but I do think that Josh Trank’s version would be a much better film overall and I would love to see his original vision. If this is the end for this franchise, I doubt that Marvel will end up bringing it into their cinematic universe outside of a possible cameo in someone else’s film, and maybe that’s for the better. Until next time, this has been Bubbawheat for Flights, Tights, and Movie Nights. 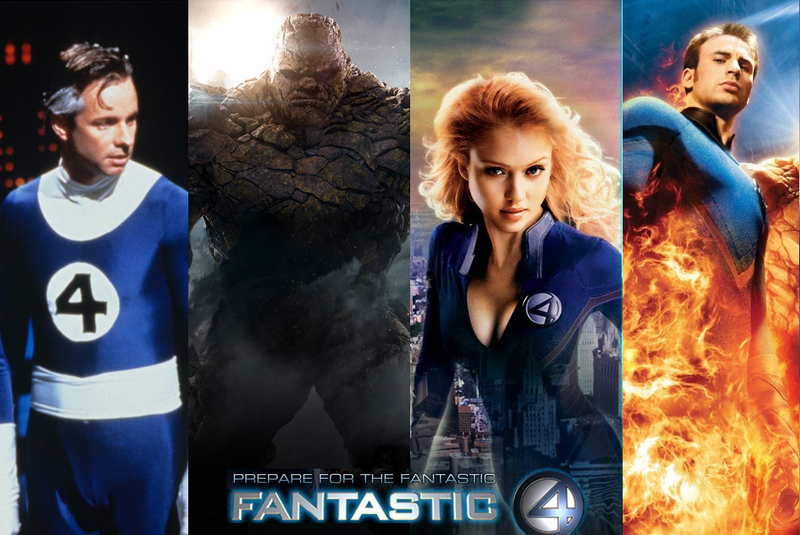 Posted on August 8, 2015, in Blogs, Lists and tagged fantastic four, film, list, Marvel, movies. Bookmark the permalink. 22 Comments. I would also blame bad scripts and meh directors. I think the script issue also goes into #4, the studio meddling tends to have multiple writers doing different drafts that ends up with a muddled mess. Fun fact that I just found out. One of the writers of the ’00 era F4 was also one of the main writers on Twin Peaks. I’ve not seen the current, nor do I plan to while it’s in theaters (which I don’t think will be a long run). Maybe when it’s streaming on Netflix. Yeah, the only versions I’ve enjoyed are the animated versions, including Pixar’s The Incredibles and only the second season of that ’90s series. It can be done, but it seems like 20th Century Fox can do good superhero movies with a mutant in it, and it better have Bryan Singer at the helm. Definitely not worth the theater trip, I did mostly enjoy it (will have my actual review up tomorrow), but it has some major issues. Fox just doesn’t seem to know what tone the film should have, and keeps getting it wrong in different ways. Like I replied to someone else’s recent review, the only version that’s done the FF justice is the 1960s Hanna-Barbera cartoon series. If you haven’t seen it, check it out on YouTube. Isn’t that the one with Robbie the Robot because they didn’t have the rights to the Human Torch for some reason? *Looks it up* I guess not. I was a fan of the 90’s cartoon, but like I mentioned, I haven’t seen it since then so I don’t remember pretty much any of it. Haven’t seen the newest version, yet, but I’m not surprised it suffers from some of the same problems. You’ve point them out very eloquently. Another issue is that the F4 is inherently hokey and steeped in 50s sensibilities. No one has been able to tap into anything about them that actually resonates with today’s audiences. In the case of the Corman and Story versions, we’re left with camp and slapstick in place of any sincere character development. Whatever honest effort at that is, as you say, forced. And like the first commenter mentioned, the scripts are just god-awful. The scripts also suffered from too many cooks in the kitchen. I do think there’s some merit to the new one, but it very clearly suffers from too much studio interference. There’s no way of knowing at the moment if the decisions that sounded absurd on paper could have translated well on screen, like the blogger/hacker alter ego that’s just briefly touched upon and the more dramatic, less action approach, even if there have been reports that no less than three action scenes were cut out of the film. I can’t believe how bad the story failed. Plus, I did hear the director of the newest one wasn’t happy with the film as it was obvious he didn’t have final cut. Then again, I’m not surprised by that as I think the studio tinkered with it too much and the result was very bad. It’s a little fascinating to see how this story unfolds. The real question is how much is damage control and how much is actually true? Yeah, that’s where I got a lot of my info about it. So much behind the scenes drama and everyone is pointing the finger at someone else. Just a shame all around really. I was rooting for it to be good and hopefully wipe away the previous installments. Now it’s clear that they will never get it right. Very good article in conjunction with my Fantastic Four debacle really shows some of the problems with the FF. I haven’t seen “Silver Surfer” or the new one yet, but I’m inclined to agree with a lot of what you say here, especially about the studio interference and the need to write a script that is centered around what story needs the F4 rather than “How can we keep a hold of these characters?” I’m halfway in agreement about the silliness of the powers; I think Torch and Thing can certainly be taken seriously, and they’re usually the least mocked among casual fans, but Mr. Fantastic really does require a huge degree of suspension of disbelief. As for Sue… well, she’s the only one whose powers were actually reworked in the comics themselves because they were too silly (the forcefield was a retcon added much later; initially, she was only able to turn invisible. Useful! *cough*) In a way, this is one aspect where the “learn to use the powers” could actually help, by normalizing things, but only if it’s done well, and I have to admit I don’t see that as being an easy task. It could just as easily make things appear goofier. The origin I’ll agree is pretty rough. It’s one of the least believable of the “radiation” origins, and that’s saying something. Skipping it altogether might indeed help a film. Doctor Doom… you know, he actually has minions in the comics. He’s got a whole horde of Doombots he’s created. But you wouldn’t see that in these films because they completely screw him up in their attempts to make a closer tie between him and the F4. Giving Doom the same origin as the F4 is a colossal mistake because Doom not only doesn’t need an origin, he demands not to have one. Doctor Doom, in order to truly be Doctor Doom, has to be a self-made man and self-made menace. The thing that makes him work, what makes him such a great villain in the comics, is that he’s intelligent enough and arrogant enough to blend super-advanced technology and the occult in ways that nobody else has even envisioned. He doesn’t have superpowers from any external source. Giving him the same origin as the F4 just diminishes him, because it says he wouldn’t be anything without a cosmic accident. But comic book Doctor Doom is one of the iconic examples of a villain who became a nightmare through sheer force of will. Silver Surfer is mainly more of the same from the first one with just as much if not more slapstick humor. Doctor Doom sounds like a villain that doesn’t work well for a single film possibly. Might be a better foe for a tv series or stretched across several movies. I really wanted the Fantastic Four movies to work, but it’s mostly because I love the Silver Surfer. He’s a legitimately interesting character. You’re right about everything else. I also would like the Fantastic Four movies to work, it just hasn’t happened yet. Good post, with some very good points. I think that the new FF film certainly adressed points #2 & #5, I felt that the origin and powers were handled rather well and could be taken relatively seriously. I still think that even though the film tried to take their origin as seriously as possible, there’s still that element of silliness that takes me away from it. Some people might be able to look past it, but I haven’t really been able to yet. It would need a much better story for that anyway.